Lisa Rasmussen at UNC-Charlotte received a [US] National Science Foundation award for a conference about ethical issues in citizen science. Lisa is part of the CSA Ethics working group, which encouraged the proposal, with Anne Bowser and me as advisors. The goal of the conference is to reach a shared understanding of the existing “gap” in ethical oversight in citizen science, and begin to understand how this gap may be filled. To involve more people in the citizen science community of practice, we invite those on Twitter to join in the discussion tomorrow (Tuesday July 11) from 2:00-3:00pmET at the hashtag #CitSciChat. The in-person conference will take place next week at the NC Museum of Natural Sciences, and then we’ll host another Twitter #CitSciChat on Thursday July 27 from 1:00-2:00pmET. PS – I’m also hosting a #CitSciChat on Wednesday July 11 from 2:00-3:00 about biomedical citizen science, and on Friday Aug 4 at 1:00 about terminology in citizen science. The NatureTech award does not have to be based on mapping or GIS technologies, but there are many options using those tools, especially in ways that provide access to land information (including especially ownership). This extended blog by Mike Miller illustrates a number of different ways that Web GIS tools could be harnessed to enhance and support environmental and cultural resource management in small islands of the Caribbean. Check out requirements for the $3,000 NatureTech prize at NatureTech.Solutions. I wrote this blog based on my experience in environmental consulting but I think many of the same principals will apply to conservation organizations. Its not just about publishing data, its about making GIS more accessible and reducing costs. 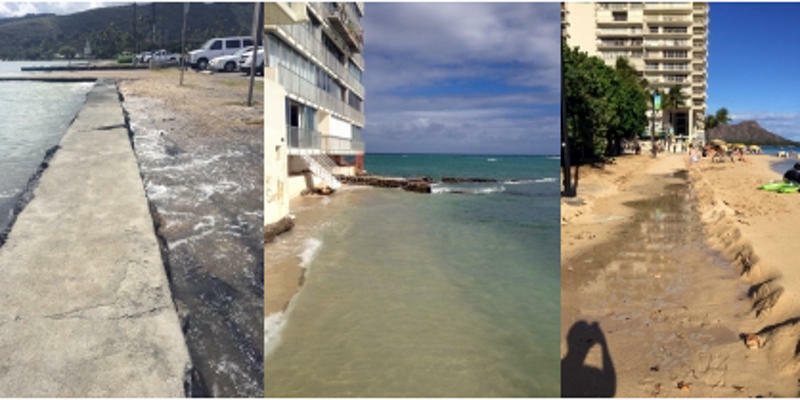 Photos of King Tides (L-R) at Maunalua Bay in East O‘ahu, Kaluahole (a.k.a. Tonggs), and Kālia (a.k.a. Grays) in Waikīkī. Who among us hasn’t dreamt of making that big scientific contribution or discovery? If that’s you, the Hawaiʻi and Pacific Islands King Tides Project may be your chance. GONSER: We’re trying to document these high water level events to give us a snapshot into what could become an everyday occurrence with future sea level rise. Matt Gonser is with the University of Hawaiʻi’s Sea Grant College Program, and he’s working on recruiting citizen scientists, ordinary folks like you and me, to collect data by snapping photos of what happens when the highest of high tides or King Tides meets sea level rise. Is there flooding? Is there erosion? MERRIFIELD: What does it actually look like on the ground? 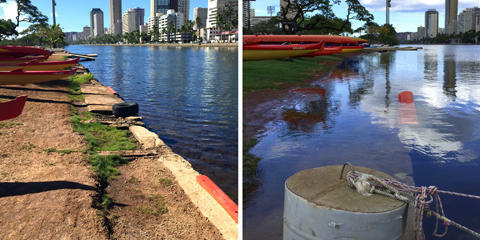 Side-by-side comparison of King Tide impact on the Ala Wai. Oceanography Professor Mark Merrifield is the Director of the Center for Coastal and Climate Science and Resilience at the University of Hawaiʻi at Mānoa. MERRIFIELD: How is the beach affected? Is it running up to the road? Merrifield has studied sea level rise for over 30 years, and says nothing can quite replace first-hand human observation. MERRIFIELD: We have a very comprehensive system but it’s not everywhere. It would be great to see what the impacts are like across the state, and that’s where the citizen scientists can really help us. Last year, Gonser recruited 60 citizen scientists contributing over 500 photosduring two King Tide events. But continuous data collection is needed when it comes to observing the combined impact of natural or cyclical changes like King Tides and sea level rise, which Merrifield says is subtle. King Tide impact observed at He’eia Fishpond in Kāneʻohe, Oʻahu. MERRIFIELD: We’re talking about inches of change over decades. It’s not something that you would point out and say that’s sea level rise, and that’s global warming. It’s a little more complicated than that. According to Merrifield the rate of sea level rise that we’ve been seeing for the last century is going to double and even triple over the next few decades. MERRIFIELD: And that’s when the awareness of it will be much more abrupt and obvious. GONSER: The reality is that change is coming and that needs to be a part of the discussion. And that’s what we hope the citizen scientist project can initiate because when you’re out there and you’re experiencing it, you can’t ignore it, it’s real. The inevitability of sea level rise is here and now the discussion moving forward is what can we do about it? The first King Tides of summer are rising with the new moon tomorrow with impacts to be seen as early as today and lasting through Friday. Project photos and links on how you can get started are available on our website. For HPR News I am Kuʻuwehi Hiraishi. How to get started as a citizen scientist with the Hawaiʻi & Pacific Islands King Tides Project? Download a PDF of the instructions here. Join Matt Gosner and the project team on Thursday, June 1, 2017, at 6:30 p.m. for a talk on upcoming King Tide citizen scientist photo opportunities. The talk will be recorded and available online. Note that one of the “semi-finalists” for the the Unilever Global Development Award Supported by Business Fights Poverty is the What3Words, and one of the basic prominent users of the What3Words technology is the island of St. Martin. This would be a natural for a NatureTech.Solutions award. Go to http://community.businessfightspoverty.org/profiles/blogs/sue-adkins-meet-the-shortlisted-companies-for-the-unilever-global to learn more about the Unilever Global Development Award. Applications for the 2017 award are due September 1, 2017. The first annual US$ 3,000 NatureTech.Solutions award will be presented to a resident of an Eastern Caribbean island on or about 1 October 2017.
by close-of-business, 1 September 2017. The award will be made by CFVI on behalf of the Potter Fund for NatureTech.Solutions] as part of the legacy of Island Resources Foundation, which provided technical assistance to conservation activities and organizations in small islands while based in the US Virgin Islands from 1971 to 2016. For details about the application process, go to http://NatureTech.Solutions, sign up with the NatureTech e-mail list by writing to NatureTech@irf.org, or write to dbrown@cfvi.org. The NatureTech.Solutions award is for a technology (a reproducible application of knowledge for practical purposes) that can be used by private or public decision-makers in small islands of the Caribbean to make better decisions about the management of natural or cultural resources. An assumption is that this technology would be information-based, but there are many ancillary potential applications such as self-contained training modules, front-ends for existing resource databases, visualizations of existing data, and so forth. Deadline for applications for the first NatureTech.Solutions award is Friday, September 1st, 2017. Unless otherwise agreed to by the Community Foundation of the Virgin Islands, applications must be submitted in electronic form through the Community Foundation of the Virgin Islands, at dbrown@cfvi.net, with “[NatureTech]” in the subject line. Instructions — The submission must be in English or Spanish, and must include instructions that would enable a potential user to actually apply the technology. Open Source — The submission must include an operational version of the technology that is in the public domain — that is, it can be used and adapted by any potential user. Electronic Submission — May be in a document format, or multi-media, or an operating application for standard operating systems, such as Mac OS, Windows, iOS or Android. Due Date: — The Application should be emailed to the Community Foundation of the Virgin Islands at dbrown@cfvi.net with [NatureTech] in the Subject line of the message, before close of business, 1 September 2017. Applicant Name, address, telephone number, email address (and point-of-contact if the application is an organization). A brief history of the innovation, highlighting the resource management need addressed by the innovation, and the applicant’s involvement in addressing that need. Description of who has been using the innovation for how long or how many iterations, what are the specific products from the innovation, and the resource management advantages from using the innovation. Current status of the innovation, including planned modifications or extensions, and adaptations for other places or organizations. Names, addresses, telephone numbers and email addresses of three people familiar with the innovation who can be contacted for additional information about the operation and effects of the innovation. Supporting documentation in the form of access procedures or instructions or software implementing the innovation may be submitted, but should not exceed the equivalent of an additional ten (10) pages. Contact CFVI if specialized support systems are required. Engagement with local organizations and agencies (and note that local agencies and non-profit/non-governmental organizations can be applicants themselves). Eight teams of innovators from around the world are competing in the Fish-Free Feed (F3) challenge, created to accelerate the development of aquaculture diets made without fish or fish oil. The aquaculture industry is growing faster than the human population, at about eight percent each year, according to the Food and Agriculture Organization of the United Nations. About 20 percent of the world’s fish goes to aquaculture, depleting wild-caught forage fish such as anchovies and krill to provide essential oils and protein for the development and growth of these cultivated foods. The first team to sell 100,000 metric tons of fish-free feed or, if that threshold isn’t reached, that sells the most feed by the end of the contest, on September 15, 2017, will be named the winner of the F3 challenge. When the world is staring down a population that’s pushing quickly toward nine billion people, aquaculture offers an efficient way to produce high-protein food for the hungry masses. But there’s a catch: While fish are feeding the multitudes of people, there may not be enough left for other fish to eat. As the farming of fish, shrimp, and mollusks expands, the old adage about “plenty of fish in the sea” may no longer ring true. The aquaculture industry is growing faster than the human population, at about eight percent each year, according to the Food and Agriculture Organization of the United Nations. About 20 percent of the world’s fish goes to aquaculture, depleting wild-caught forage fish such as anchovies and krill to provide essential oils and protein for the development and growth of these cultivated foods. The Fish-Free Feed (F3) challenge was created to accelerate the development of aquaculture diets made without fish or fish oil. Eight teams of innovators from around the world were attracted to the sustainable premise and the promise of a $200,000 (USD) prize, raised through crowdfunding and sponsorship from the Monterey Bay Aquarium, the New England Aquarium, the University of Arizona, and the World Bank. The first team to sell 100,000 metric tons of fish-free feed or, if that threshold isn’t reached, that sells the most feed by the end of the contest, on September 15, 2017, will be named the winner. Cutting out the “middle fish,” TerraVia’s AlgalPrimeDHA can provide omega-3 essential fatty acids from algal sources, rather than using fish as sources of fish oil for fishmeal. “There’s a lot of research going on out there, the problem is getting the word out in the industry and getting people to recognize that all kinds of ingredients — single-cell proteins, algal extracts or insect meals — could be used instead of fish,” says Fitzsimmons, chair of the contest committee. Beyond generating new feed formulations, he also hopes the contest will connect alternative ingredient manufacturers with feed companies and investors who can help smaller companies scale up production. One of those smaller companies looking to ramp up production is TomAlgae, a Belgian-based manufacturer of microalgae that feeds shrimp during the earliest life stages. By growing a specific diatom under carefully controlled conditions, they take the guesswork out of nutrition and avoid contamination with pathogens that can reduce the nutritional value of this food source. This specialized feed can’t compete with the bigger companies on a tonnage level, notes van der Riet. Under ideal conditions, about 100 grams of the freeze-dried micro-algae (which is rehydrated before use) could feed one million shrimp larvae and produce about 15 tons of shrimp meat. The F3 challenge is a way to join with other companies producing fish-free products and create a complete chain of sustainable feeds for aquaculture, starting from the hatchery stage, he says. 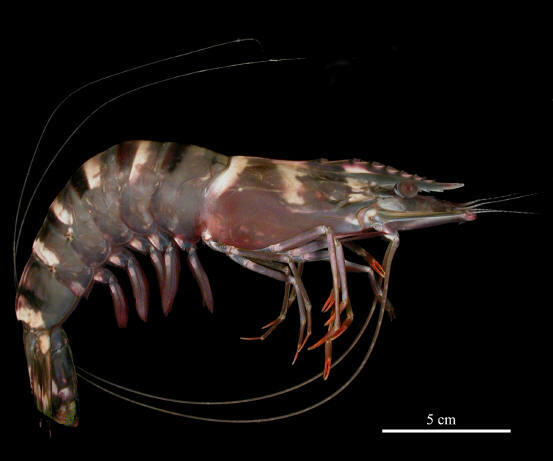 Asian tiger shrimp (Penaeus monodon). Photo by David Knott/ Southeastern Regional Taxonomic Center, Charleston, South Carolina. On a larger scale, algae is harnessed by TerraVia, a California-based company, to produce docosahexaenoic acid (DHA), one of the omega-3 essential fatty acids (EFA) found in fish oil. Roughly 400,000 tons of fish oil go into feeds for farmed salmon and trout, making aquaculture the single biggest industry for consuming long-chain omega-3s like fish oil, notes Walter Rakitsky, TerraVia’s senior vice president of emerging business. Algae is the original source of the EFAs that bioaccumulate in fish. Previously focused on extracting oils for biofuel production from algal fermentation, TerraVia uses its bioreactors in Brazil to produce DHA. With facilities capable of making tens of thousands of tons of AlgalPrimeDHA, Rakitsky estimates that every ton of their algae-derived DHA saves about 40 tons of wild-caught fish. With a sustainable ingredient to offer, TerraVia teamed up for the F3 challenge with Star Milling, a Bay Area feed company, and TwoXSea, an environmentally motivated fish wholesaler headquartered in San Francisco. Their contest entry is a rainbow trout feed produced by Star Milling, and formulated for TwoXSea by USDA research physiologist Rick Barrows to include the TerraVia’s algae-made DHA as well as other healthy ingredients such as flax oil and pistachio meal. The quest for healthier fish food wasn’t new to TwoXSea, a company cofounded by Bill Foss, a hi-tech expat who helped start a seafood restaurant — called Fish. — to serve sustainable seafood and educate consumers. 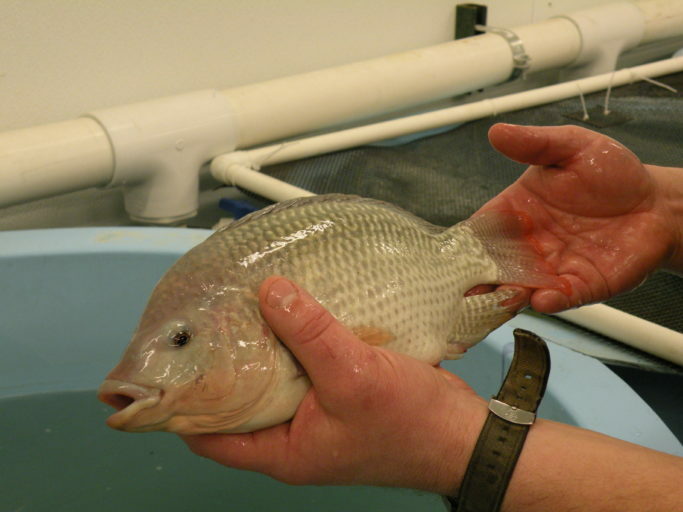 Tilapia reared at the USDA Bozeman Fish Technology Center facility. This is the favorite fish of Kevin Fitzsimmons, an aqualculture expert at the University of Arizona, because it has an optimal “conversion rate” that produces the most amount of edible fish for the least amount of feed. Photo by Wendy Seale. The obvious solution, for Foss, was to stop sourcing seafood from somewhere else and start farming freshwater trout on a plant-based diet. He calls the process “renewable” rather than sustainable. “We want to be involved in things that can be replicated, so that generations from now we’ll still have access to the same fish,” he says. Similar to Foss’ restaurant patrons, more than one kind of meal needs to be on the aquaculture menu because each species has different nutrient requirements. For example, the plant-based foods formulated for omnivorous tilapia might not be suitable for carnivorous salmon. The Ridley Corporation, a leading agri-feed producer based in Australia, focused on developing feed for prawns, a seafood for which experts estimate that global aquaculture production will grow by more than 5 percent in the coming years. 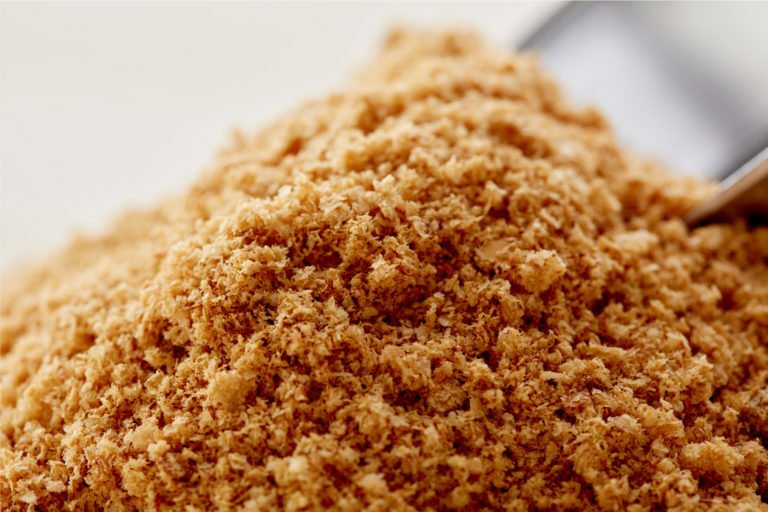 With a novel ingredient called Novacq, their contest entry represents a long-term effort to develop more sustainable feeds that boost growth performance, enhance disease resistance, and reduce waste. Those kind of opportunities are lining up. Before the next competition milestone in mid-January — a first tally of sales receipts for the new feeds — the F3 contestants are invited to a round of meet-ups with fellow competitors, selected industry insiders, and investors. 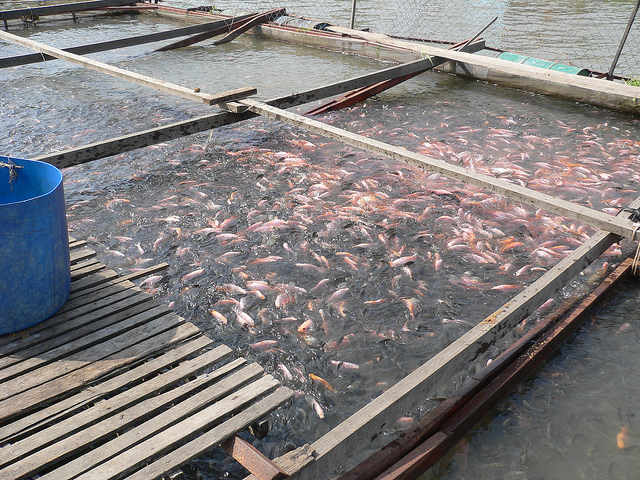 Tilapia farming in floating cages in Vietnam. Photo by Khaw Hooi Ling. Could these innovation tools support a NatureTech Solution in the Eastern Caribbean? [This article was published in the on-line magazine BOATINTERNATIONAL . I remain totally flummoxed — and frankly skeptical — about these weird financial tools that The Nature Conservancy has been developing and promoting for the past decade or more, but it would be great if they could be handily adapted to the needs of countries like St. Lucia or Grenada. The Innovation Award recognises an individual or group that has been responsible for the development of the most promising new innovation for the benefit of the marine environment this year. Nominees for the Innovation Award must have taken a lead on the initiation or completion of one or more new innovation for the benefit of the ocean, or seen another significant milestone towards the development of that innovation. Last year the Nature Conservancy, a global charity, pledged “to conserve the lands and waters on which all life depends”, and created a ground-breaking marine investment model when it brokered a debt swap between the government of Seychelles and its Paris Club creditors. This resulted in the restructuring of $21.6 million of Seychelles’ debt in exchange for a commitment by the 115-island archipelago to invest in marine conservation and climate adaptation initiatives, not least the creation and management of a marine reserve of more than 400,000 square kilometres, which will be the second largest in the Indian Ocean. As Maria Damanaki, the charity’s global managing director for oceans, explains, it specialises in debt-for-nature swaps, having completed “15 of them around the globe, mostly via a US government mechanism called the Tropical Forest Conservation Act. However, funding for TFCA dried up and the Conservancy began to look for additional opportunities to develop debt swaps, or ‘debt conversions’ as we prefer to call them”. This was the first that supported marine conservation. Born in Crete, Damanaki became the youngest-ever member of the Greek parliament, and served for 25 years. And in 1991 she became the first woman to lead a political party in Greece. Latterly she spent four years as European Commissioner for Maritime Affairs and Fisheries, during which the commission oversaw the recovery of fish populations to much healthier levels. Indeed the continuation of her fisheries policy could result in there being 15 million more tonnes of fish in the sea than there were, and 30 per cent more jobs. Danajon Bank in the Philippines is one of only six double barrier reefs in the world. It’s also among the most degraded, with some of the highest rates of overfishing. Pollution and a declining fish population mean local families are finding it hard to feed themselves. Discarded micro-filament nets, which take hundreds of years to degrade, add to the issue. Net-Works – a collaboration between the Zoological Society of London and Interface, the global carpet tile manufacturer – has created a community-based supply chain that encourages local communities to collect and sell discarded nets, thereby generating income for themselves. The nets – more than 100 tonnes have been collected so far – are then exported to Slovenia, where they are recycled into yarn to make high-quality carpet tiles. To date, more than 900 families have benefited from the income. And the sea is cleaner. This afternoon the U.S. House of Representatives passed the compromise version of S. 3084, meaning that it will soon become law. The surprising turn ends a 4-year odyssey for legislation that triggered a bitter partisan battle over how the National Science Foundation (NSF) manages its $7 billion research portfolio. The last step came after House members had gone home for the holidays—but left themselves a parliamentary loophole through which to pass unoffending legislation. That allowed a recently negotiated compromise between the House and Senate versions of the bill (see story, below) to make its way onto the House floor today. Representative Barry Loudermilk (R–GA) introduced the measure, and though no actual vote was taken, the bill was deemed passed by unanimous consent. The bill now goes to President Barack Obama, who is expected to sign it. It will replace a 2010 reauthorization that expired in 2013. In the predawn hours Saturday, the U.S. Senate passed a bill to bolster innovation and research activities at NSF, the National Institute of Standards and Technology, and various research and education programs managed by the White House Office of Science and Technology Policy (see earlier story below). The legislation’s bipartisan appeal allowed it to win unanimous approval shortly before the Senate adjourned for the year after passing a spending bill that freezes agency budgets through April 2017 and avoided a government shutdown. But procedural objections by one senator prevented the Senate from acting quickly enough to send the bill to the House of Representatives before its members left town last Thursday. That means the bill won’t be going to President Barack Obama’s desk to be signed into law. Still, supporters are hoping that the hard-fought compromise serves as a template for quick action after the new Congress convenes in January 2017. Congress has reached a truce—and possibly a lasting settlement—in the fiercely partisan 3-year war between Republican leaders in the House of Representatives and the scientific community over how NSF should operate. The terms of the agreement, between House and Senate negotiators, may seem like minor changes. But the compromise, which the Senate could adopt as early as this week, resolves differences over how NSF should conduct peer review and manage research in ways that the agency thinks it can live with. The battleground is a reauthorization of the 2010 America Creating Opportunities to Meaningfully Promote Excellence in Technology, Education, and Science (COMPETES) Act, which sets out policies governing NSF, the National Institute of Standards and Technology (NIST), and federal programs on innovation, manufacturing, and science and math education. Reauthorization bills don’t fund an agency, but they provide important policy guidance. Since 2013, the House has adopted a succession of bills containing language that scientific leaders argued would have restricted NSF’s ability to support the best research. The strategy, coordinated by Representative Lamar Smith (R–TX), chairman of the House science committee, over the objections of committee Democrats, included favoring some disciplines over others and linking basic research projects more tightly to improvements in health, the economy, and national security. Republicans said they were simply trying to ensure that every NSF grant serves “the national interest.” But many scientists interpreted that language to mean NSF should tilt toward funding applied research with obvious payoffs. Their Senate counterparts, in contrast, united behind a single, bipartisan piece of legislation crafted by senators Cory Gardner (R–CO) and Gary Peters (D–MI) that scientists saw as much more supportive of the research enterprise. And it is that bill (S.3084), which was approved earlier this year by its science committee but never reached the Senate floor, that seems to have largely prevailed when legislators from both houses sat down to reconcile their different approaches. The final text strongly endorses the two criteria NSF now uses to judge its grant applicants—the “intellectual merit” of the idea, and the “broader impacts” of the research on society. The “national interest” categories favored by Representative Smith remain in the bill—increasing economic competitiveness, advancing the health and welfare of the public, training a globally competitive workforce, strengthening national security, and enhancing partnerships between academia and industry. But they are now listed as examples of how researchers can satisfy NSF’s second criterion—broader impacts—rather than as the primary rationale for the proposed research. At the same time, senators bowed to their House counterparts by removing language setting any spending targets. The original Senate bill called for a 4% boost for NSF and NIST in 2018. But House leadership has banished any statements in authorization bills relating to a desired amount of future funding, in keeping with their commitment to reduce the federal deficit. So the conferenced COMPETES bill is silent on funding levels for any specific program, as well as for the agencies as a whole. Senate leaders are hoping to win passage this week of the bill, which as of this morning had not been publicly posted on a government website. Its prospects are less clear in the House. And its status could be affected by how soon Congress adopts an extension of the spending freeze that applies to the current budgets of every agency. NSF is not officially commenting on the bill. But one agency official who requested anonymity said there are no poison pills in it, and that much of the bill seems to offer support for things NSF is already doing. The bill also addresses several issues that have spurred sharp debate in recent years. NSF’s flawed oversight of the National Ecological Observatory Network, for example, has led to tighter oversight of large facilities. Congressional displeasure with the large salaries of some academic scientists, called rotators, coming to NSF for stints of 2 to 4 years has prompted new reporting requirements. But other issues transcend the agency, like reducing the administrative burden on universities receiving federal funds, policing scientific misconduct, and allowing for travel to scientific conferences. The bill would require a formal analysis of the proposed cost of a large facility before construction begins, and another while it is being built. Management fees are still allowed (the House had wanted to ban them), but their use must be closely monitored. NSF must provide written justification for the salaries of every rotator earning more than a senior government manager in the equivalent job. NSF must notify other federal agencies when it issues a finding of scientific misconduct. The bill does not say whether the notification must be made public. The language addresses concerns that such “bad apples” might be funded by another government agency. A long-running program meant to help states that receive relatively few federal research dollars would become a permanent feature of NSF’s portfolio. The “E” in the Experimental Program to Stimulate Competitive Research would be changed to “established,” in recognition that few states have ever graduated out of the program. An interagency working group would be created within the White House to examine ways to reduce the paperwork associated with receiving a federal research grant. It is seen as complementing a provision in medical reform bill poised to become law, the 21st Century Cures Act, that would create a Research Policy Board with the same mission. The bill would require federal agencies to clarify their policies on travel to scientific conferences and workshops. It endorses the importance of allowing employees to attend scientific conferences and workshops to share their findings and foster collaborative research. GFIA IS NOW LOOKING FOR SPEAKERS TO PRESENT INNOVATIONS AT GFIA EUROPE – HOSTED IN THE NETHERLANDS FROM 9-10 MAY 2017. At each GFIA event a huge array of game-changing, sustainable agriculture innovations are assembled. Speakers are needed from all disciplines – including private companies, entrepreneurs, not-for-profits, universities and research centres. Innovations are needed that can be used right along the value chain, and that support animal production, aquaculture, crop production, horticulture and organic. Whether high tech or low tech, at the ideas stage, or part of an ongoing research project, if your innovation has the potential to improve productivity in a sustainable way, we want to hear from you. Innovations are presented in the Open Innovations Theatre – a large theatre on the exhibition floor that is free to attend for all attendees. Speakers selected for the programme have up to 15 minutes to share the details of their innovation (in the style of TED talks), in a way that is inspiring as well as informative – and maybe even a little entertaining! Defend the Data You’ve Got . . .
University of Toronto Heads ‘Guerrilla Archiving Event’ to Preserve Climate Data ahead of Trump Presidency. The University of Toronto and other academic institutions are participating in an event to archive climate and environmental data before president-elect Donald Trump takes office on Jan. 20. President-elect Donald Trump isn’t even in office yet, but environmentalists are deeply concerned about his views concerning climate change and the environment as a whole. Many are also worried that, once he takes office, years of climate and environmental research could be lost or much harder to access. On Saturday, the University of Toronto, together with the University of Pennsylvania, is hosting what it calls a “guerrilla archiving event” to preserve any climate and environmental data before Trump takes office. It takes place at the Faculty of Information and runs from 10 a.m. to 4 p.m. The event coincides with the Internet Archive’s End of Term 2016, a project that aims to preserve federal government information found on the internet at the end of each presidential term. You may already be familiar with the Internet Archive: it’s home to the Wayback Machine, which searches old versions of web pages after they are updated. One of its offices is at the University of Toronto. The fear of information being deleted isn’t new. Sam-Chin Li, a government information librarian at the University of Toronto, who will be giving advice and direction to those involved on Saturday, said she was involved in archiving many federal government websites in 2013 when the [Canadian] Conservatives announced an amalgamation of 1,500 sites into one. She feared that much of the information could have been lost. Li said that the incoming presidency worries her. “Access to government information is so important. It’s really a foundation for a function of democracy. And we’re seeing all those things disappearing in front of our eyes, so how can we stand there not working?” Li said. Michelle Murphy, director of the University of Toronto’s Technoscience Research Unit, said that anyone can participate in Saturday’s event. The organizers don’t just need those with tech skills, but also people who know how to research and are familiar with environmental issues. Though the university doesn’t have any firm numbers on those who will attend, as of Wednesday afternoon, the Guerrilla Archiving Facebook page had 76 people who had confirmed they would be at the event. The prospect of losing access to U.S. information isn’t just an American problem. Patricia Kim, a graduate fellow at the University of Pennsylvania’s Penn Program in Environmental Humanities, will be in Toronto on Saturday to participate in the event. The two universities are working together to develop a framework for other academic facilities to utilize. The university — whose effort is called #datarefuge and will take place Jan. 13 to 14 — is providing short-term storage with a goal of long-term. Trump’s recent decision to choose Scott Pruitt as head of the EPA — he is known for opposing the EPA and even suing it during his time as Oklahoma attorney general — is concerning to Kim. “What we’re seeing is environmental McCarthyism,” said Kim. But Kim is doing her part to safeguard existing databases and research, and she’s looking forward to participating in Saturday’s event. Trump seemed to have wavered on his stance on climate change during a November visit to the office of the New York Times, saying that he’d “keep an open mind.” Still, that doesn’t mean he plans to soften his stance on the issue, Kim said. That’s why she’s taking action now.